I’m back from a semester abroad, I’ve moved off campus, and I’m an upperclassman. Fall 2015 has been a period of adjusting to say the least. Last spring I had probably the best semester of my college career studying at the John Felice Rome Center. So being back in Chicago has been a little more challenging than I anticipated. I absolutely love going to school in Chicago, but not being able to explore a new country every weekend is a bit of a bummer. I’m also back to taking classes for my major rather than taking courses about Italian language, literature, and culture. But I’m adjusting. 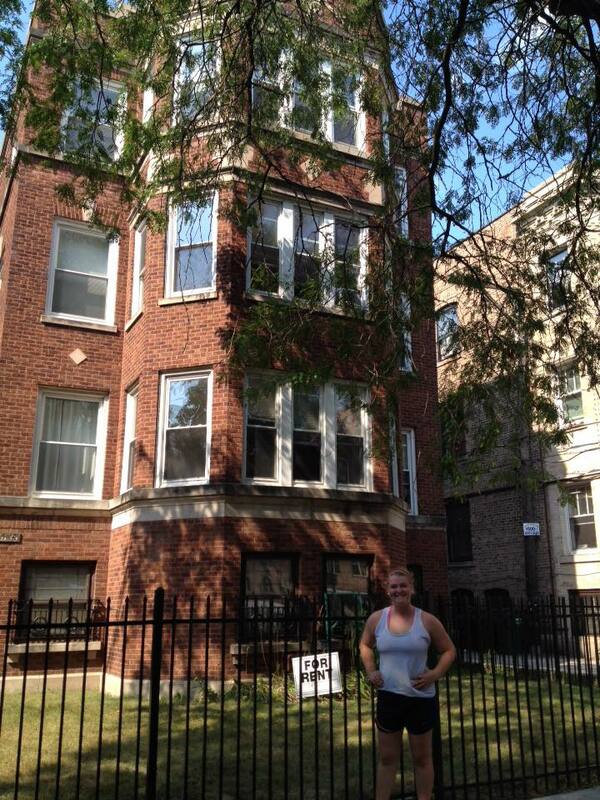 This year I signed my first apartment lease and get to live off-campus with two of my best friends. 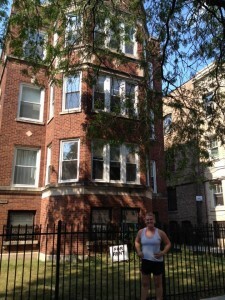 We decorated our apartment perfectly and it makes Chicago feel that much more like home. But off-campus living isn’t all bliss, now I have to begin the adjustment to adulthood as we pay bills, deal with our landlord, and leave on-campus living luxuries behind (i.e. wi-fi and dining halls). But I’m adjusting. I’ve finally made it to upperclassman status, which has been absolutely surreal. It feels like I was a junior in high school about two minutes ago, so how on earth did I make it to my junior year of college? Now that I’ve finally adjusted to being in college, I’m nearly finished. Which really freaks me out. I’ve finally made it through most of my CORE classes (LUC’s fancy way to structure “gen eds”) and nearly all my classes pertain to my major (and I’m still adjusting to even having a major). I’m at a point in my life where I thought I’d have things pretty well figured out. As it turns out I’m not quite there yet. But I’m adjusting. We’re already halfway through the semester, but I’m still working on adjusting to doing college in the US again, living in a real Chicago apartment, and being half way through my college career. I’ll let you know if I ever actually adjust. Somehow this semester slipped past me and now here I am trying to write end of the semester papers and study for finals…in Rome. It’s hard enough to push through finals week in Chicago and now I’m finding it even harder here. My classes are starting to feel like actual classes and I have to prepare to fly back to the States in just one week. Where did my semester go? My course load definitely isn’t as intense as usual because I am taking less credits this semester. The harder part about my finals week is going to be balancing my studies with finishing off my Roman Bucket List. I lucked out with a pretty good finals schedule that should allow me ample time for sight-seeing…assuming of course I get this 2,000 word essay finished. 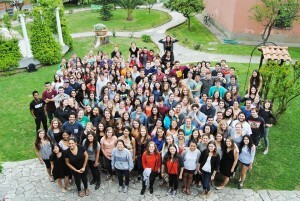 THURSDAY: The last day of classes at the JFRC is followed up by the End of Semester Banquet. “A Night Among the Ruins” more lovingly referred to as JFRC Prom, will be the last time that all of the students, faculty, and Student Life Assistants will be together as one big group. We’ll celebrate an absolutely incredible semester with good Italian food, an awards ceremony, and some really great people. FRIDAY: The JFRC’s Fine Arts Festival begins on Friday. Early in the afternoon students who earned the International Leadership Certificate will give poster presentations to the administration about their leadership experience abroad. At 5 that evening is the JFRC players performance of “A Midsummer Night’s Dream” (which I’m in! ), using the JFRC’s courtyard as our stage. This performance is followed by an art exhibit from the sculpture class and fiction readings from the writing fiction course. SATURDAY: Final exams begin! All students will be taking their Italian exams on Saturday and to celebrate crossing final #1 off the agenda my friends and I plan to celebrate by going out to dinner at a Roman restaurant we have yet to visit. 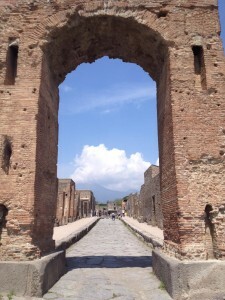 SUNDAY: For a bit of a study break 2 of my friends and I planned a day trip to Pompeii–one Italian destination we had yet to visit. Don’t worry though, we’ll be studying on the train. MONDAY: It’ll be back to the books for most of us (especially for me as I have 2 tests on Tuesday). So I see potential for a mid-afternoon gelato break. That evening the Fine Arts Festival continues with vocal performances from the voice class and a viewing of the short films created by the film class. TUESDAY: My last day of testing with finals for my European Novel course and my Italy Culture and Context course. Hopefully there will be time for an afternoon nap to refuel and go on a Roman adventure that evening–I’m thinking about finding a good spot to watch the sunset over the Eternal City. WEDNESDAY: One of my friends is done early with her finals as well so we’ll spend the day exploring the city. The number one sight on our list is “The Keyhole”–a literal keyhole on a gate that perfectly frames a view of St. Peter’s Basillica. THURSDAY: By this point hopefully I will have started the expedition that is packing my suitcase for the journey home and making sure my room is all cleaned up before spending one last night in the city. One of our SLAs mapped out a walking tour of Rome (gelato stops included) that hits all of the major sights. 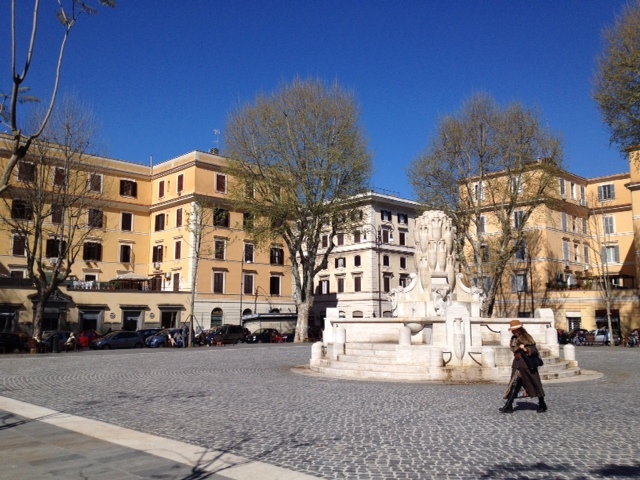 So I’ll have a chance to say good-bye to Roma–for now anyway. Friday morning the entire JFRC has to be cleared out by 10 in the morning and all 235 of us will be on to our next adventures. Some are staying in Europe for another week or so, a few spending most of the summer here, and then there’s those of us (like me) who will be returning to the States. See you in a week, America! Before I set out for my semester abroad people told me that my experience would be one of the most enriching experiences of my life–and an experience that would look good on a resume. 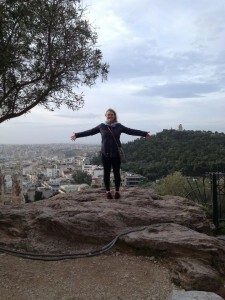 I planned on coming abroad regardless of adding a line to my resume, but when I first got here I wasn’t sure how exactly I could even put my study abroad experience into a few sentences that would get me hired. I didn’t think that “Studied in Rome and had the time of her life” would translate quite how I wanted it to. But the John Felice Rome Center had my back this semester and thanks to a new program I easily earned a certificate that allows me to put “Study Abroad” on my resume that says more than “I experienced Italy for 4 months”. This semester Student Life Assistant Jessica and the JFRC’s Director Emilio Iodice put into place the JFRC Student Life Leadership Certificate. The goal of this certificate was to offer students something tangible to market their study abroad experience with by participating in activities and organizations they would have been involved in regardless. To earn the certificate students had to complete 4 of the following: Enroll in Emilio Iodice’s leadership course, be a member of Student Activities Committee and organize or lead an event, participate in calcio as a captain or commissioner, go on the WWII study trip, write a reflection paper in any format (as in this blog post! ), volunteer at panini distribution or the Ronald McDonald House, or attend two of the four monthly leadership workshops. Then at the end of the semester (this coming Friday, actually) students will give poster presentations reflecting on their leadership experiences from the semester. This certificate has enriched my study abroad experience by allowing me to market the past four months of my life in a positive way to future employers, so that they know I did more than prance around Europe seeing sights and eating good food. All of the programs and clubs that counted towards my certificate are things I would’ve been involved in anyway this semester. And now I’ve got proof that I was enriched as a person and of course as a leader this semester. “Global Leadership” is an intimidating term that I’ve heard tossed around here and there, but now I’ve realized that this term is much more accessible than I thought. My time here has shown me that a good leader is a good leader no matter where in the world they are. And when you become a “Global Leader” you are certainly more aware of the world and more willing to adapt yourself to someone else’s culture in order to lead to the best of their ability. I don’t think I could pinpoint all the ways I’ve been changed this semester, but when I get home I know it will be obvious to others and myself that my time abroad impacted my life in positive ways. I’ve been calling Rome “home” since January, but there is still so much of this city that I have yet to explore. Before this month is over my friends and I will be checking out the lesser known neighborhoods of the city. Who knew there was more here than the Colosseum?…Only kidding. For our Italian class we had to visit a neighborhood in the city and then give a presentation about our experience to the class (all in italiano of course). So on Wednesday morning a friend and I headed to the southern part of the city to do some exploring in the neighborhood of Testaccio. I’ve been here briefly during the Food Truck Festival I took my family to last week, but this time around we just needed to explore. One of the first sights we saw in the neighborhood was a pyramid. After conquering Egypt the Romans had quite a love for Egyptian architecture, so though it seems out of place this Egyptian touch wasn’t a huge surprise. This pyramid is a funerary monument dedicated to a member of the College of Septemviri, who died somewhere around 12 BC. We walked down the street a ways and found the Piazza Testaccio, a really beautiful square that was especially clean for Rome and then continued on our adventure. The best thing we stumbled across all morning was the Mercato Testaccio. This market was very similar to the Mercato Trionfale I visited a little while ago, but I enjoyed Testaccio’s more. It was a bit smaller, calmer, and cleaner than Trionfale’s and would definitely be worth a second visit. This neighborhood would be considered on of the more “hipster” neighborhoods in Rome so many of the stalls sold goods that are pretty trendy–as in gluten free pasta and a juice bar. Part of our project included interviewing someone that worked in the neighborhood. We pulled up a chair at the juice bar and talked with a girl named Anna (who made us some delicious juice). Anna told us how she was born in Rome, but her father is of Sicilian descent. She’s been working at the juice bar for a few months because a friend of hers owns it, but her real passion in life is studying monkeys. She actually has a doctorate in biology and hopes to continue researching monkeys again soon. 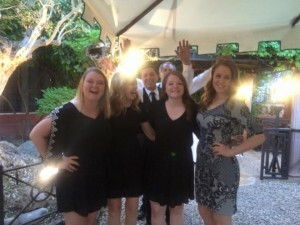 Anna is one of the nicest people I’ve met in Rome–she even offered us some travel advice as we finish out our semester abroad. I wouldn’t be surprised if we meet her again soon because that juice was really, really good. We did a little more exploring in the neighborhood to see what is left of the stockyards that used to be very important for this area as well as Monte Testaccio. Monte Testaccio is essentially an ancient Roman dump that consists of rubble from broken oil lamps. We only caught a glimpse of this hill from the street, but I’m sure a more in depth tour would be really interesting. 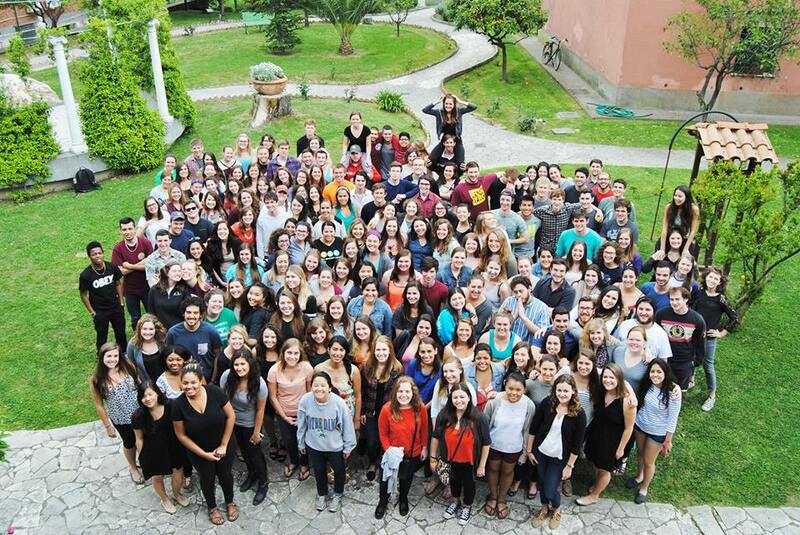 I’m grateful this Italian project got us out of the JFRC’s campus and into a really cool neighborhood for the day. Next week, project or not, I’ll have to keep up these Roman neighborhood adventures. Easter has always been a holiday I celebrated with big family meals, Easter egg hunts, and attending church, so I knew this year it would be hard to celebrate this holiday away from home. Because my friends and I were all in the same home-sick boat we did our best to make our most of Easter in Italy by taking a little beach vacation to Sicily (the island the boot of Italy is kicking). As soon as we landed I could tell we picked the perfect spot for our long weekend. Sicily is filled with all sorts of cliffs, hills, mountains and of course the beach. The coastline was absolutely beautiful and the Mediterranean was an incredible blue and turquoise. 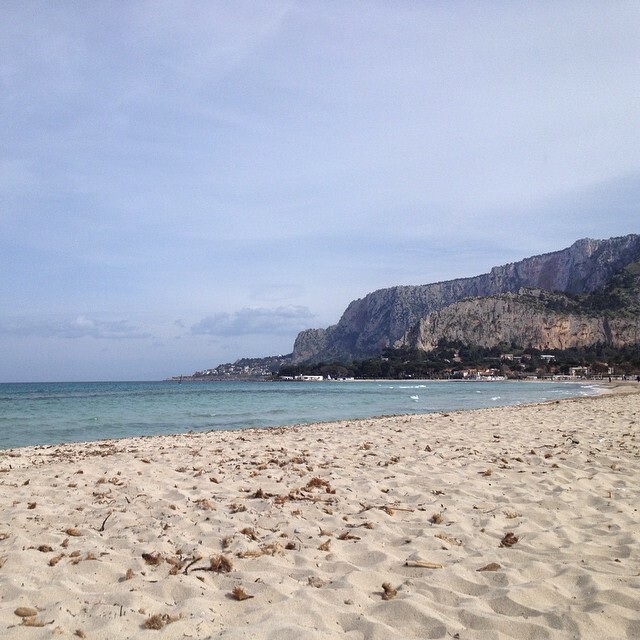 The AirBnB we rented for the weekend was in the town of Mondello–a tiny beach town just north of Palermo. The apartment was just around the corner from the center of town, 3 blocks from the water, and had a view of the sea from the bedroom. Yea, it wasn’t too bad. We ate lunch at a pizzeria just off the boardwalk and we were proud to say that we could definitely taste a difference between the Roman pizza we’re used to and the Sicilian pizza (I like Sicilian better). Then after a quick afternoon nap we laid on the beach until the sun sunk below the hills. We did a little grocery shopping at the alimentari for snacks and ingredients to make our own Easter dinner on Sunday. We ate dinner next door to the pizzeria we were at for lunch. My friends enjoyed some fresh seafood pasta, while I opted for pizza again. The rest of our evening was spent playing card games in our apartment. After sleeping in on Sunday morning we inspected the goodies the Easter bunny left us (thanks for sending us sweets Mom and Dad! ), put on our swimsuits (even if it wasn’t quite warm enough to swim) and made our way down to the beach. We laid in the sun for the next few hours, managed to get a little sun burnt, then ate some gelato. We decided that the best way to make it feel like a holiday was to cook dinner ourselves. It wasn’t the ham and potatoes I usually get at home, but we cooked up some pretty good (and authentic) pasta. I think we pulled off a pretty good holiday weekend for ourselves. I was grateful to be in place where the only thing I wanted to see was the beach, rather than a bunch of museums and monuments. Sicily on Easter made for one Buona Pasqua!